A WUWT contributor who calls himself “justthefacts” has written a post which attempts to tout the so-called “pause” in global warming. It’s pretty well summed up by the title of this post. I’ve come to expect that from all corners of the denialosphere. What surprised me, however, was the conclusions based on data for snow and ice. I’ve mentioned before that it’s no use even talking to those who deny that what’s happening to the cryosphere is powerful evidence of global warming. They’re so deep in denial they can’t be reasoned with. There appears to have been a negative trend in Northern Hemisphere Sea Ice Area and Extent, especially around Minimum and a positive trend in Southern Hemisphere Sea Ice Area and Extent, thus the resultant Global Sea Ice Area trend appears to be slightly negative. However, in recent years does appear to be a pause as a result of increases in Southern Hemisphere Sea Ice Area and Extent, balancing out decreases in Northern Hemisphere Sea Ice Area and Extent. “Pause”? There’s no “pause.” The 5 lowest values on record all happened in the last 7 years. The lowest of all was 2011. And the trend is decidedly downward. Evidence of a “pause” is nonexistent. So how did he reach such a wrong conclusion? There are many contributing factors. First, he looked at a graph in which anomaly values are squeezed into a very narrow plot range, which makes it easy to think you’ve seen a pause. 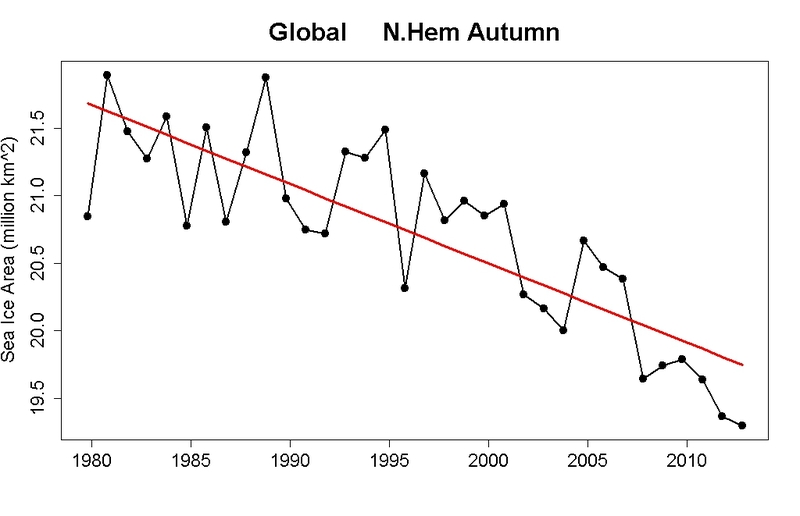 Second, there are seasonal differences in global ice trends which make graphs less amenable to visual interpretation. Third, he did no analysis at all. None. Fourth, and most relevant, it’s what he wanted to see. 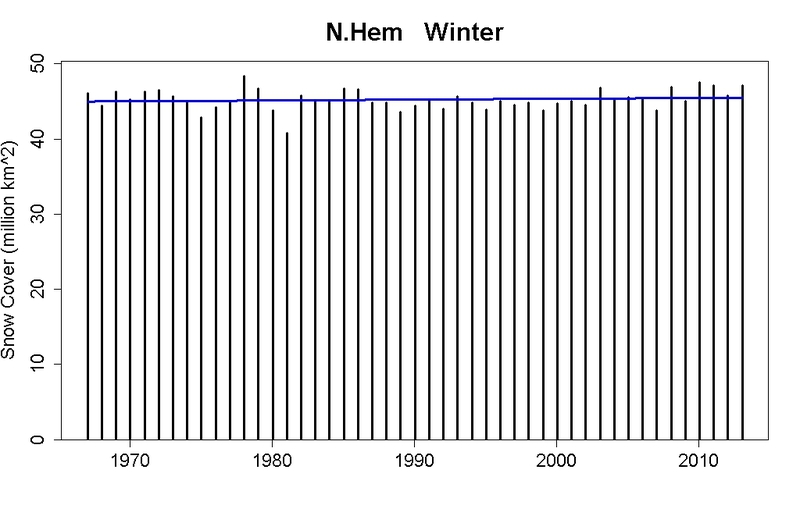 While none of the Snow plots offers a global perspective, when looking at the Northern Hemisphere, there appears to have been a slight increase in Snowcover and Winter Snow Extent, a decrease in Spring Snow Extent and no change in Fall Snow Extent over the historical record. To hear those conclusions, you’d think that changes in snow cover are no big deal, let alone any evidence of a warming climate. There looks like an upward winter trend, estimated at +11,000 km^2/yr, but looks can be deceiving. The trend is not statistically significant. The estimated total change due to trend from start to finish is a gain of 0.51 million km^2, but again that’s not significant. 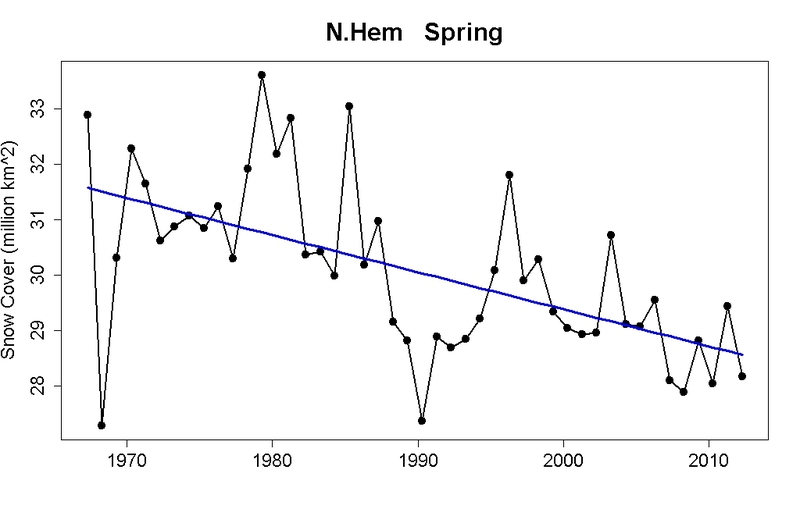 Spring snow looks to be in decline at a rate of -67,000 km^2/yr, and this trend is significant. The estimated total change due to trend from start to finish is a loss of 3.02 million km^2. 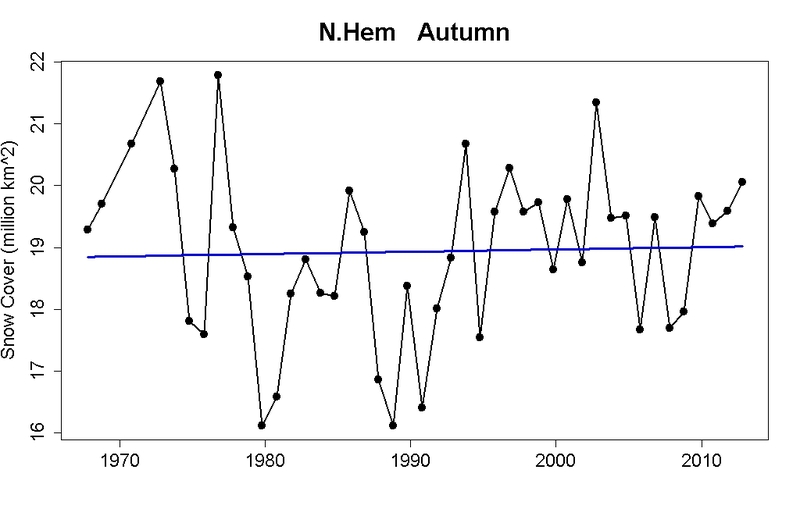 The estimated autumn trend is a mere +3,700 km^2/yr, which is nowhere near significant. The estimated total change due to trend from start to finish is a gain of merely 0.17 million km^2, again nowhere near significant. To summarize, of the three seasons he shows only one exhibits a statistically significant trend. And for that one, the trend is a decrease in snow cover. 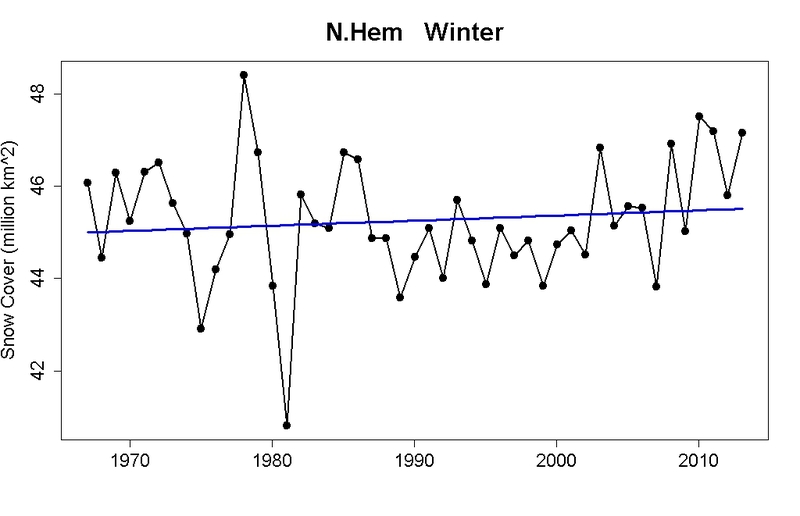 Even if we take the estimated trends (significant or not) of all three seasons and sum them, with winter at +11,000/yr and autumn +3,700/yr while spring is -67,000/yr, the total comes to decrease at a rate of -52,000 km^2/yr. His characterization is misguided and misleading, at best. The estimated summer trend is -88,000 km^2/yr, which is overwhelmingly statistically significant. The estimated total change due to trend from start to finish is loss of a whopping 3.94 million km^2. Summer snow cover is extra important because that’s when we get the most sunlight, so the reduced albedo (there’s less snow to reflect sunlight back to space) has its greatest effect. And by the way, evidence of a “pause” is nonexistent. His treatment of snow cover is just another case of looking at graphs which make trends harder to see, doing no analysis at all, and more to the point: seeing what he wants to see. Except for the added twist of leaving out the most important data, which also most strongly contradicts his wrong conclusion. I’ll bet that WUWT contributor “justthefacts” actually believes he stuck to “just the facts.” He didn’t. He also drew conclusions. Unfortunately for him, and for us all, his conclusions are wrong. In my opinion, the root cause is that when he looks at the facts, he sees what he wants to see. Based on the limited Global Ice and Snow measurements available, and noting the questionable value of Sea Ice Area and Extent as a proxy for temperature, not much inference can currently be drawn from Earth’s Ice and Snow measurements. 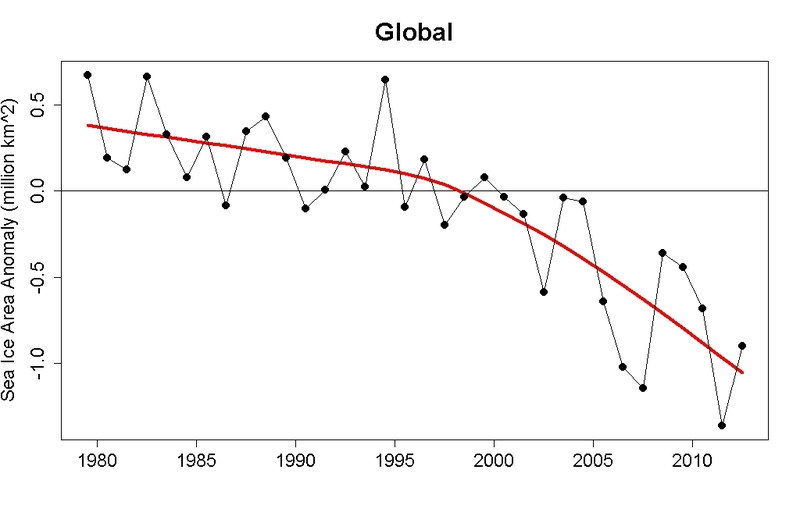 However, there does appear to be a pause in Global Sea Ice Area. Not much inference? The changes to snow cover and sea ice are so dramatic, that if you don’t infer there are dramatic changes to the climate happening right now, then you’re in denial. Just as one can see what one wants to see, one can also not see what one doesn’t want to see. Perhaps he’ll read this post and realize that he didn’t just stick to the facts about ice and snow, that he also drew conclusions, and that he was just plain wrong. Perhaps he’ll admit that what’s happening to ice and snow are powerful evidence of global warming as well as powerful evidence against a “pause” in global warming. Perhaps he’ll even re-evaluate his entire approach to the entire issue. A few months ago I wrote about how James Taylor of the Heartland Institute was misrepresenting a paper that analyzed polling results of the Alberta Professional Engineer and Geophysicist Association (APEGA). Justthefacts excerpted an Investor Business Daily post about Taylor, and so I ventured over to WUWT to correct the record. I demonstrated, repeatedly, that justthefacts and IBD were wrong, that Taylor was wrong, and called upon justthefacts and Anthony to run a correction or even retract the article. I gave up trying after a couple of day and a half of trading comments with various people, and when I checked a week or so later, the post was still there. At that point two things were clear to me – justthefacts is not actually interested in the facts (or else he would have retracted the article), and neither is WUWT or most of the people who read it. I’ve read a few posts by justthefacts – he should change his name to havenoclue. Is “justthefacts” related to the exceptionally bad cfact.org radio program of the same name? I find the whole “Arctic ice is declining, but Antarctic ice is increasing, therefore ice cover is pretty stable world-wide” idea idiotic (even if it were true). Coincidentally, I was looking at the spring snow cover two days ago as I put together a letter to the editor as part of a rebuttal to some bit of silliness someone had written: He claimed ice-off dates on our small lake hadn’t changed over 100 years so therefore global warming isn’t happening (wrong, and face-palm wrong–I was very polite in my response though). Based on how long it took me to research and write a 500 word response, I’m again in awe of bloggers who do that sort of thing on a regular basis. Research is easy enough, writing coherently isn’t. I know quite a few who use handle “just the facts”. None of them do. I read recently that the Arctic ice decrease dwarfs the Antarctic rise by a factor of 25. ….. “percentage of ocean cover” weird metric – looks a bit shakey. “Percentage of ocean cover” does look dodgy as you say. Yet as a comparison between trends in Arctic & Antarctic ice, these ratios of percentages are still not useful, even if you take a more reasonable maximum for your 100%. You could compare, say, 2012 minimum SIAs for Arctic & Antarctic with their average minimum SIAs over the first half of the satellite record (1979-95) to establish absolute Arctic & Antarctic change, and divide by their respective average maximum SIAs 1979-95 to yield a percentage. That would give you Arctic -19.3%, Antarctic +1.5%, a ratio of -13 to 1. However it isn’t a useful figure as in 2011 it was +37:1, 2010 was -11:1, 2009 was -48:1 and so on. The quoted 25:1 was attempting to emphasis the relative importance of summer Arctic ice loss vis a vis Antarctica. Yet do not think that Antarctica is in any way a “hockey stick” free zone. Recent % ice melt on James Ross Island in Antarctica (graphed here in red) is “now at a level that is unprecedented over the past 1,000 years” according to the findings of Abram et al 2013. Of course, such ‘unprecedented’ events are not found everywhere in Antarctica as CarbonBrief report, but that is hardly reason to celebrate. What I found fascinating was the number of times justthefacts discussed “statistical significance”. None. At all. Lots of short term graphs, with no analysis whatsoever to see if they meant anything. I doubt that justthefacts knows how to compute statistical significance. Most of WUWT has no idea what significance means, much less how to compute it. Well, I’m reminded of an ongoing conversation on Hubpages with a gentleman who, following Claes Johnson, feels–and I choose my word intentionally here–that a putative temperature correspondence between the 1 bar level on Earth and the 1 bar level on Venus demonstrates (and I quote) “a lack of relationship between CO2 and temperature” in the Venusian case. He thinks I’mconfused, poor soul. So I guess that CO2 must actually be doing something on Venus. What about the change in volume of snow cover? Is there a significant trend? Does it matter? There are serious problems in estimating snow mass. Unlike snow covered area or sea ice area, there isn’t a satellite method that works very well yet. The ways we estimate snow mass generally include combining computer models of the snow on the land surface with measurements of snow depth at meteorological stations. Unfortunately, stations are missing from a lot of areas. The latest (and probably best) product is ESA’s GlobSnow, which uses microwave measurements by satellites and measurements of snow depth on the ground. Unfortunately microwaves don’t work in areas of very thick snow and there are lots of other uncertainties in there. I think the team working on it have done a great job, it’s just a really hard problem. Regardless, they did find a declining trend in snow mass for March (Luojus et al, 2011: http://ieeexplore.ieee.org/xpls/abs_all.jsp?arnumber=6050051 ), but of the order of <10% of original mass, and they didn't report the statistics. I can't find any other analyses. I think people misunderestimate “justthefacts” – after all the subtitle is “that fit my conclusions” – ! Oh, nice post by the way. I’m sure “justthefactsthatfitmyconclusions” will be disappointed when/if they come across the latest analysis showing more Antarctic ice volume loss (on land, of course) than previously thought. After all, the Arctic is an ocean, so “sea ice” is paramount, but the Antarctic is a continent, so “sea ice” is marginal (literally). Have to agree with MorinMoss – clueless. justthefactswuwt (presumably the same person) is compiling denier charts of paleo temperature reconstructions. It’s agonising. jtf put up yet another article on WUWT the other day, with half a dozen or more denialist charts of GISP2 based on Alley data. All of them had global or NH charts tacked onto them – one had HadCRU3 series showing today’s NH temperatures as minus 31 degrees C or so. Their provenance ranged from anonymous photobucket and tinypics accounts through to jonova and WUWT! It would have taken 15 minutes to do a fresh chart from the source data, but jtf has put up numerous articles wanting to ‘crowdsource’ these denier monstrosities to see which are ‘correct’. And WUWT-ers are happy to graft instrumental *global* temperatures onto proxy paleo *local* temperature series as long as it’s a denier chart. Yet they think that comparing *global* proxy reconstructions to the modern *global* instrumental record can’t be done. He changed that one after I complained in a comment on that page. Its astounding really. You just leave out summer. Who’d have thought it was so simple? I don’t think it’s fair – publishers are held to account over widely publishing information which is intentionally misleading, why should Anthony Watts be held to a different standard! He should be sued out of existence so that he can’t spend his ill gotten gains. I think some young lawyer that perhaps wants to make a name for himself should crowd source some funding to file suit against Anthony Watts. [Response: He has a right to express his opinion, no matter how stupid it is. Unless you can demonstrate slander/libel, or falsehood which puts people in “clear and present danger” (which must be imminent, even immediate, and climate change is too slow for that), I don’t see how you’d have a case. But I’m not a lawyer. We of course are all familiar with the good Cap’n Watts, Lord Projector of the United Nescience of Wattsupia. Given his long voyages questing for that fabulous archipelago known as the Urban Heat Islands, he is probably too busy to invest all the hours he would like in Human Resources. So it is likely he cannot find the time to vet all his little helpers. And remember that while you or I require only a few seconds to gain a full assessment of the abilities of justthefactswuwt, Cap’n Watts works on different time-scales. If the progress he has made with his search for his fabulous archipelagos is a gauge in this, a full vetting of the abilities of justthefactswuwt could take him effectively for ever. Consider the task at hand philosophically. It is no easy matter proving non-existence. Off-topic, but Nic Lewis’ long-forewarned paper on climate sensitivity has been published. The denial publicity machine seems to be cranking up, as it did for Spencer & Braswell some time ago. An interview on Fox, an op-ed in the WSJ? Popcorn-time? Oh I would love to see that happen: Watts trumpeting a paper that confirms the IPCC sensitivity range. Well, I think he is right about one thing: “…and noting the questionable value of Sea Ice Area and Extent as a proxy for temperature…”. 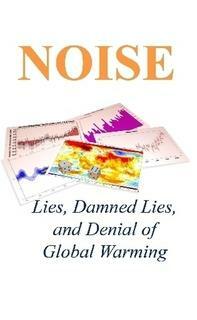 Sea ice volume would be a better proxy but then the facts would fit his conclusions even less well. I can’t believe your mass is gone so soon. All of the time the jet stream moved along. Just the facts has always added bags of interpretation and those interpretations are always blatantly and wilfully wrong. Because I am a really, really, mean person, in my mischievous mind I always translate “just the facts” to “just the lies”. What does the physics say (I’m only conversant with moderate stats)? It would seem to me from general physics knowledge that more water in the atmosphere would lead to more winter precipitation–a.k.a. snow–so a small, insignificant increase during the coldest period doesn’t surprise me greatly. But I don’t know if that is what the actual measured physics says. Unfortunately it is totally believable. What unbelievable to me is how anyone would use their “analysis” for investing life savings when that is the sort of “talent” they hire. Solomon is a real nasty piece of work, with a rap sheet even worse than David Rose’s (if that’s possible). Not surprisingly, the commenters over there are 98% right-wing authoritarian follower nutcases, with one poor guy named Liam trying to hold the fort of reason. Quelle surprise. JTF is doing a ‘cold reading’,and his (?) audience is obediently remembering the hits,and forgetting the misses. The position of the sun varies a total of about 47 degrees from summer to winter solstice. The southern edge of the northern hemisphere snow also varies by about that amount in latitude from summer to winter. So the angle of the sun relative to the snow is roughly constant. Given that the winter snow extent is 10 times that of summer, it would appear that winter snow cover is more important than summer snow cover relative to albedo effects. Or am I missing something? I’m trying to make sense of this comment. But taking it as a given, I go on to ask why we care particularly about the angle of the sun at the snow line? Actually, as that line moves northward, the angle of the sun at the line must decrease with warming. That hardly means that we don’t have a problem: we still have a lot more area with higher albedo than we used to have. I suppose, but adapting the rest of the lyrics will be a challenge. I’d better ask a master. Have you noticed how Earth Day has become a party? You don’t hear of climate change. That would be a downer. It would be good to have a slightly satirical way to bring this to people’s attention. Do you know the way to old Earth Day? I’m going back to find some peace of mind in old Earth Day. Earth Day is a great big party. Fossil fuel is a magnet. With some gas in your tank you’re never alone. Can’t wait to get back to old Earth Day. It’s easy when there’s a good tune and good idea to work with. OK, I concede I am missing the point. The sun angle relative to snow is the same in summer as in winter, therefore, so is the intensity of the sunlight. Days are longer in summer, say three times more sun than in winter. If two thirds of the winter snow is in darkness at any time, there is still three times more winter snow being subjected to sunshine than summer snow which is one tenth the extent. Therefore how is there more albedo in the summer? The point is this: it’s not about the total amount of snow, but about the impact of, say, 1 m^2 of snow cover disappearing. Imagine yourself standing at the edge of snow cover, in summer vs. in winter. As you correctly point out, in both cases you see the sun rise to the same height at noon; but, because in winter you are at a much lower latitude, the diurnal solar path, a circle in the sky, is much more tilted, and over half of it is below the local horizon. In summer, the solar circle is less tilted and in fact lies completely above the horizon. Around the clock, your m^2 of lost snow cover will absorb way more solar energy in summer than in winter. I think you need to start looking at the sun angles for times of day other than noon. For example, at the north pole, the sun is at the same elevation all day – it just goes around the sky in a circle. Even though the noon sun is lower in the sky at the pole, compared to lower latitudes, it is higher in the sky for other times of the day (e.g. midnight). On June 21, the total solar radiation received on a horizontal surface at the top of the atmosphere is greatest at the pole, and varies only slightly with latitude. Time of day makes a huge difference. Wouldn’t it be more useful to consider a longer period of time? I’m new to this issue, but I do understand the idea of geologic time. Is a mere decade and a half really anything worth noting? Yup, you read that right, he’s now criticising Hansen for predicting something before it occurred. Well, he’s being consistent, isn’t he? I mean, if he had to give up considering short timespans, he’d pretty much be out of business. Whereas I agree with your conclusions regarding the continued downward trend of global see ice, and the lack of ability of SH increases to balance out NH decreases (etc. ), what about the idea that (Winter/Fall) snow-fall trends are significant– when viewed more properly against the backdrop of what was expected/modeled/projected? Snowfall trends and responses to a warming climate have been a bit more nebulous to pin down on a regional scale, but the idea is out there that a general downward trend is the expected value for the Northern Hemisphere. In that light, even a flat-line, much less a “insignificant” increasing trend can then be said to be significant, yes? It’s not a net-zero change that is the baseline for comparison when the discussion is about how close snowfall is adhering to what we expect to happen. I certainly don’t go so far as to call it a party to a full-on ‘pause’, but at some point I think even a flat-line snow cover trend becomes worthy of a more fuller understanding rather than dismissing it as not-significant. Brown and Mote (2009) comes to mind here. Note that while it is warming, it is still cold (below freezing) near the poles during winter. What is more, moisture content of the atmosphere is increasing. Cold + water=Snow. Not sure why this should be surprising. Actually, Salamano, a small increase in winter precipitation (snow) is entirely expected with warming, as a warmer atmosphere holds more water. The 28 year trend in snow extent derived from visible and passive microwave satellite data indicates an annual decrease of approximately 1 to 3 percent per decade with greater deceases of approximately 3 to 5 percent during spring and summer. Precipitation in regions of seasonal snow cover appears to be constant or increasing slightly in some locations over the same time period, which suggests that diminishing snow cover is the result of increasing temperatures. 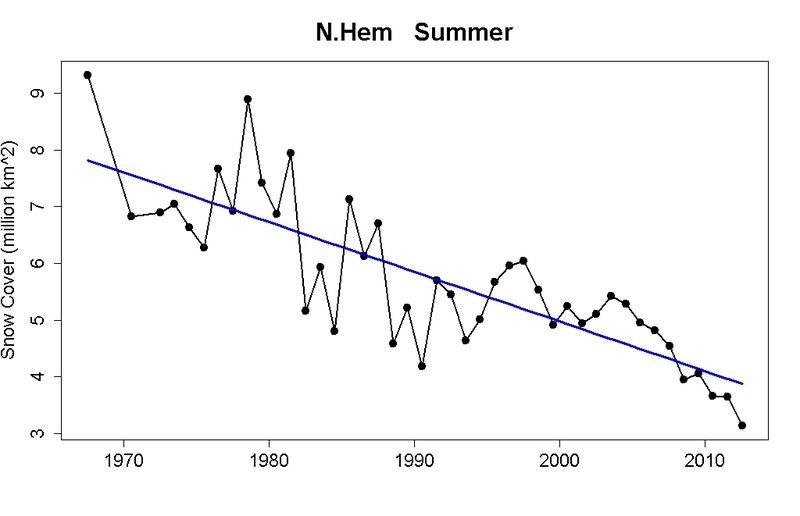 And given that summer sun angles are steeper, with higher insolation, a decreased snowcover during summer months results in the largest possible decrease in yearly albedo, the highest feedback leading to more warming. WRT the Brown and Mote 2009 paper you refer to, I believe you have misinterpreted that work. 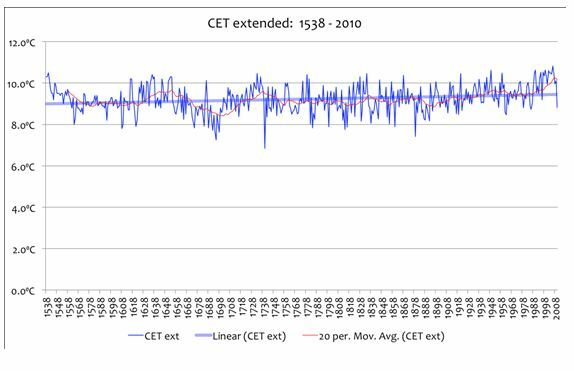 They state that they were discussing “snow cover duration (SCD)” as sensitive to warming, not seasonal snow levels – meaning that decreased coverage over the course of the year (more months without snow) is exactly what they discussed, and indeed what we are seeing. However, there is currently no generally accepted measure of ice volume, as Cryosat is still in validation and the accuracy of measurements from Grace are still being challenged. Sea Ice Area and Extent are cited as proxies for “Earth’s Temperature”, however there is significant evidence that the primary influences on Sea Ice Area and Extent are in fact wind and Atmospheric Oscillations.